A new discovery could explain why obese people are more likely to develop cancer, scientists say. A type of cell the body uses to destroy cancerous tissue gets clogged by fat and stops working, the team, from Trinity College Dublin, found. 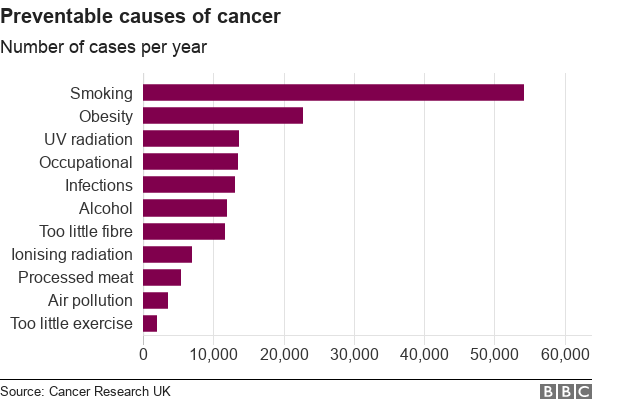 Obesity is the biggest preventable cause of cancer in the UK after smoking, Cancer Research UK says. And more than one in 20 cancer cases - about 22,800 cases each year in the UK - are caused by excess body weight. Experts already suspected fat sent signals to the body that could both damage cells, leading to cancer, and increase the number of them. Now, the Trinity scientists have been able to show, in Nature Immunology journal, how the body's cancer-fighting cells get clogged by fat. And they hope to be able to find drug treatments that could restore these "natural killer" cells' fighting abilities. Prof Lydia Lynch said: "A compound that can block the fat uptake by natural killer cells might help. "We tried it in the lab and found it allowed them to kill again. "But arguably a better way would be to lose some weight - because that is healthier for you anyway." Dr Leo Carlin, from the Cancer Research UK Beatson Institute, said: "Although we know that obesity increases the risk of 13 different types of cancer, we still don't fully understand the mechanisms underlying the link. "This study reveals how fat molecules prevent immune cells from properly positioning their tumour-killing machinery, and provides new avenues to investigate treatments. "A lot of research focuses on how tumours grow in order to find metabolic targets to stop them, so this is a reminder that we should consider the metabolism of immune cells too."